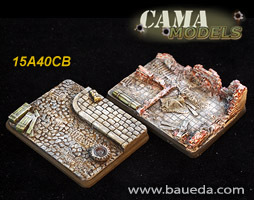 15mm WWII all Vehicles scenic bases - compatible with Flames of War AVAILABLE NOW! 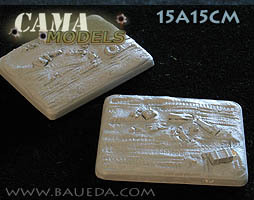 2 different large vehicle scenic bases each 50mm wide by 65mm deep (2"x 21/2"). 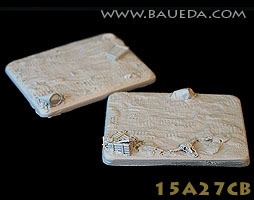 A set of two bases cast in tough polyurethane resin and beautifully sculpted with a marked urban theme. 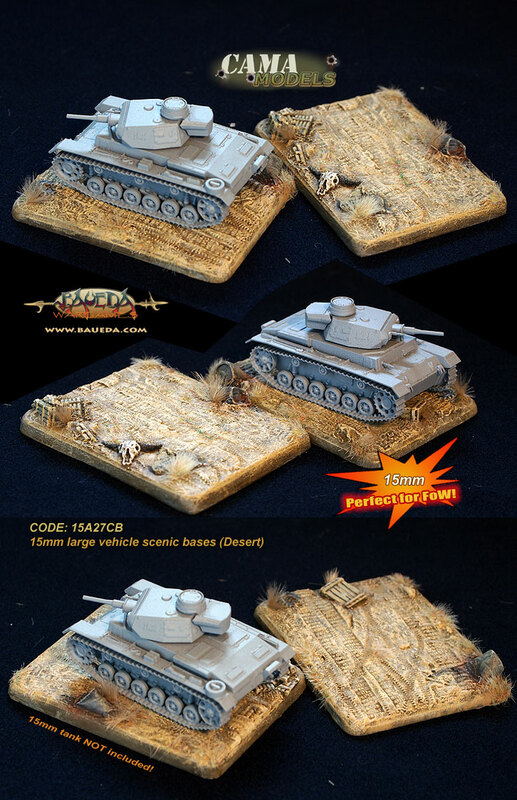 Designed to accommodate extra large 15mm vehicles (like tanks!) 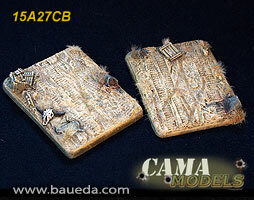 that would not fit on standard medium bases they are also perfect to base artillery or to make your own objectives! Fully compatible with Flames of War standard basing, there is plenty of deep carved details to help you in painting them! A set of two bases cast in tough polyurethane resin and beautifully sculpted with a marked desert theme. 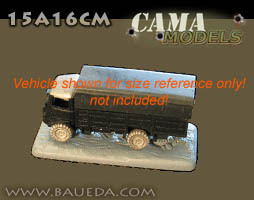 Designed to accommodate extra large 15mm vehicles (like tanks!) 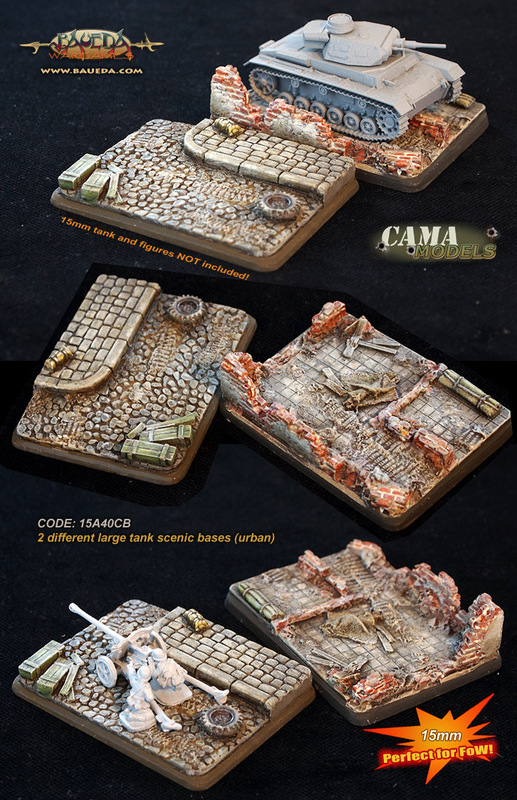 that would not fit on standard medium bases they are also perfect to base artillery or to make your own objectives! Fully compatible with Flames of War standard basing, there is plenty of deep carved details to help you in painting them! 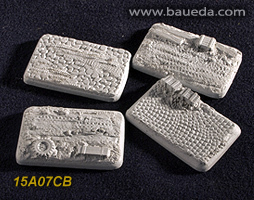 4 different Vehicle scenic bases (rural) each 32mm wide by 50mm deep (11/4"x 2"). A set of bases cast in tough polyurethane resin and beautifully sculpted to accommodate 15mm vehicles and perfect also for bike or jeep teams. Designed to be fully compatible with Flames of War standard basing, the surface detail is up to our usual standard with plenty of depth to help you in painting. Painted samples will be available soon! Code: 15A15CM We are redesigning it! 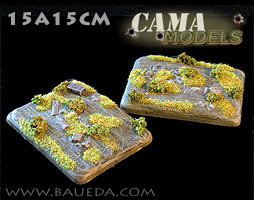 2 different large vehicle (tank) scenic bases each 50mm wide by 65mm deep (2"x 21/2"). 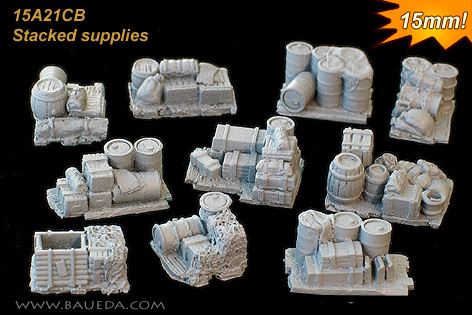 A set of bases cast in tough polyurethane resin and beautifully sculpted to accommodate extra large 15mm vehicles that would not fit on standard medium bases. 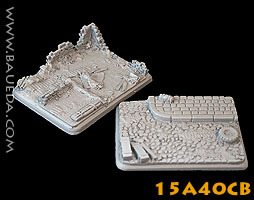 Designed to be fully compatible with Flames of War standard basing, the surface detail is up to our usual standard with plenty of depth to help you in painting. Code: 15A16CM HURRY! ONLY A FEW LEFT! 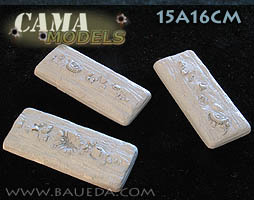 3 different extra long Vehicle scenic bases each 32mm wide by 74mm deep (11/4"x 3"). 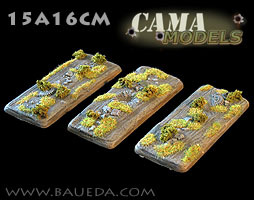 A set of bases cast in tough polyurethane resin and beautifully sculpted to accommodate extra long 15mm vehicles that would not fit on standard medium bases. Designed to be fully compatible with Flames of War standard basing, the surface detail is up to our usual standard with plenty of depth to help you in painting. There are several different designs of this item, pack contains a random selection! Supplied unpainted. 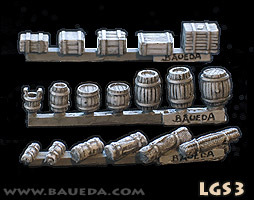 This is something different: a pack chocked full of beautifully detailed accessories you can use to customize and add interest to your units and terrain! 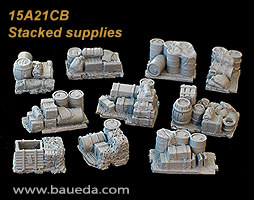 Cast in tough polyurethane resin and designed for 15mm figures, these are the perfect solution to make your own objective markers, truck loads, hastily built barricades, and a hundred other different uses! The pack contains nine different clumps of stacked goods piled on wooden boards, including roll-ups, wooden boxes, jerrycans and drums, picked at random out of the ten design shown. They are just waiting to go on your bases! Pack contents can vary. Supplied unpainted. All sizes are approximate. 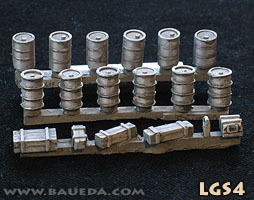 Code LGS3 and >Code LGS4 WWII supplies!